Gerber Life Insurance was founded in 1967 and has business throughout the United States, Canada and Puerto Rico. Gerber has more than $45 billion of life insurance and over 3.3 million policies. 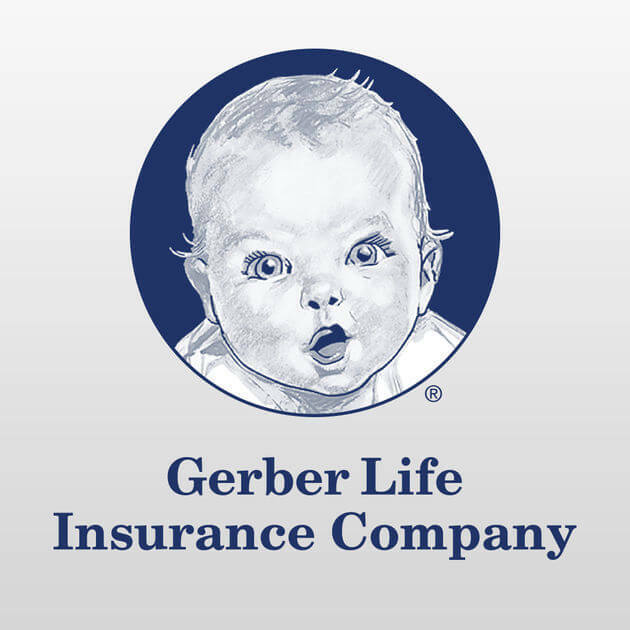 Gerber offers life insurance for both adults and children. There are many options to choose from. Gerber prides themselves on providing affordable plans to their customers. Gerber currently holds an A+ rating with the BBB and an A with AM Best. Term Life Insurance is for families who want affordable, consistent coverage. Gerber offers 10, 15, 20 or 30-year term policies, and, the premiums are level for the entire duration of the term you choose. The coverage options range from $25,000-$150,000 and you can get up to $100,000 life insurance with no medical exam if you’re between the ages of 18 and 50. Gerber life insurance is one of the most recognized household life insurance names in United States and has consistently been a leader in providing term life insurance to families. Whole Life Insurance is designed to keep one covered for their entire life. The rates will never increase, and coverage lasts a lifetime. Whole life coverage also gains cash value. The money that pays for the insurance also gets set aside like a savings account; the longer you own the policy, the more cash value will build up. You can take out your cash value whenever you like. Coverage options range from $25,000-$150,000. There is no medical exam required for most cases for ages 18-50. Guaranteed Life Insurance is designed for people ages 50-80, typically those looking for burial insurance. Coverage is guaranteed regardless of your health history which means there are no medical exams or health questions. Gerber guaranteed life insurance also builds cash value each year that premiums are paid. Coverage options range from $5,000-$25,000. Accident Protection Insurance is a very affordable way to keep yourself covered while you’re alive. Accident coverage helps protects you against accidental death or a disabling injury. Coverage options range from $20,000-$100,000. Spouses are pre-approved for a combined total of $200,000 if you are both between the ages of 19-69. There are no physical exams required and no health questions either. Some rates are as low as 7 cents a day. Benefits never reduce and monthly premiums never increase. Gerber’s Grow-Up plan is a whole life insurance policy designed for children ages 14 days to 14 years old with death benefit options of $5,000 up to $50,000. One of the greatest things about the Gerber Life Grow-Up Plan is that the coverage amount automatically doubles at age 18. This means that if you have a $15,000 life insurance policy for your child, that same policy will automatically double to $30,000 with no additional increase in cost. Grow-Up plan is a great way to provide the gift of life insurance to your children or grandchildren. Did you know you can build cash value in a whole life insurance policy that can also be used to pay for your children’s college education? Gerber’s Life College Plan is a whole life insurance policy that grows cash value that isn’t impacted from the volatility of the stock market. That means your policy doesn’t lose value when the stock market goes down, a great reason why it’s a valuable tool to utilize for college savings. Death benefits for Gerber life insurance college plan range from $10,000 to $150,000 which are guaranteed when the policy matures, this assumes you pay all of your premiums on time. Is the Gerber Life College Plan taxable as income? Yes, upon distributing available cash value in the policy, you will receive a 1099 from Gerber. Unlike a 529 college savings plan, the Gerber Life College Plan is not required to be used for educational expenses. It’s what it’s designed for, but as life changes, you aren’t restricted to using the benefit only for education. And, 529 plans are subject to market changes which can impact the growth, Gerber Life College Plan will offers a stable and predictable growth model to meet the expectations of your future education costs. If you’re already a Gerber life insurance policy holder, you may need access to your Gerber life login account. Below is link to the page you need to visit to login to Gerber life.